An aerial view of the unfinished Versailles construction site in Orlando, Florida. 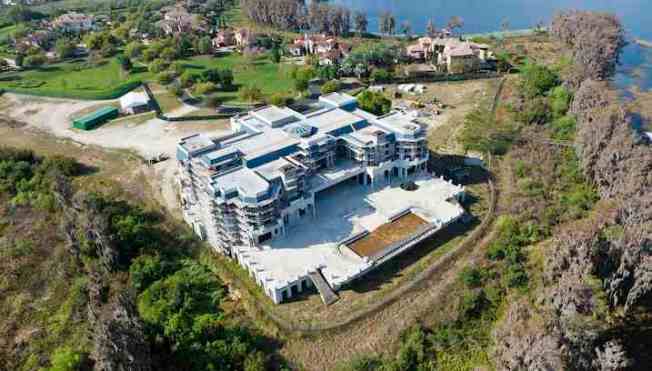 If you saw The Queen Of Versailles, you're familiar with the story--a billionaire constructs a 90,000,000-square-foot mansion in Florida, intending it to be the most expensive family home in the United States, only to have the rug pulled out from under him when the housing market collapsed. Inspired by the Palace of Versailles in France, the mansion is not complete, and it would be pretty expensive to do so. As a result, the price has been dropped $10 million. So what do you do with 90,000,000 square feet? Yes, 90,000,000! This palatial home includes a dining room that seats 50, a 10,000-square-foot fitness room and spa, an arcade room with a two-lane bowling alley, a main chef's kitchen, four fireplaces, a 1/2-acre main deck with infinity pool, and three private grotto spas. There are 13 bedrooms, a 20-car garage, and three pools. And probably a partridge and a pear tree, somewhere. It doesn't end there. We can't forget the grand ball room, two sweeping staircases, and a 30x8 foot stained glass dome that took three years to make. To top it off, there's a two-story wine cellar. The property is located on more than 10 acres set against 1,250 feet of shoreline on Lake Bulter. Every full bath has a full-size Jacuzzi tub, and the 160 triple paned windowsand Brazilian mahogany french doors cost $4 million alone. The behemoth home is three stories and 67 feet tall. The seller will finish the home for the buyer to agreed specifications for $100 million. Some might say it's the bargain of a lifetime.